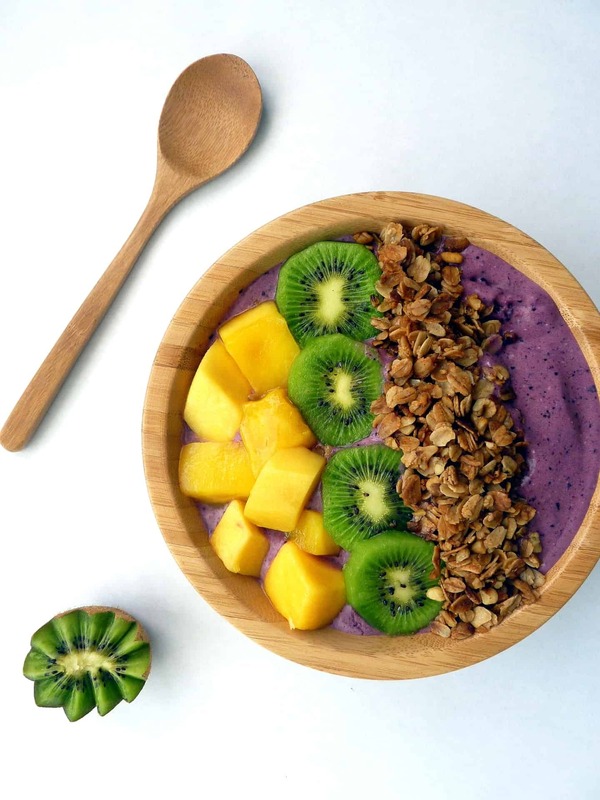 Smoothie bowls have been on a social media takeover lately, filling instagram feeds and pinterest boards with their vibrant colors and variety of toppings. While smoothie bowls may be the new health food trend, the acai bowl is a classic – especially in surf towns. This Tropical Acai Bowl recipe takes me all the way back to my first ever acai bowl in Hawaii almost 10 years ago! I make my acai bowls with acai powder instead of the frozen puree packs because the powder is way cheaper and doesn’t have added sugar. Thanks to Thrive Market’s low prices I can get 40 smoothie-bowls-worth (that’s a real unit of measurement don’t judge me) of acai powder for $24. If I was using frozen acai packs then 40 smoothies would cost me close to $80! The powder is every bit as nutritious as the puree packs so I definitely recommend the powder. Acai berries are a berry native to Brazil and are very high in antioxidants. Their high antioxidant content has landed acai berries on top of a variety of superfood lists. This is where things get tricky, because of the high antioxidant content and exotic origin, marketers saw an opportunity to capitalize on the acai berry. This led to a lot of unfounded claims about miraculous health benefits from consuming acai – most of which proved to be fake. One thing is certain though, there are antioxidants in the acai berry and antioxidants are good for you. How much antioxidants are in acai? That depends on who you ask, some studies have found them to have over 10x the antioxidants of blueberries. That’s why I add acai powder into all of my blueberry smoothies! But you want to know the best part about acai berries? They are absolutely delicious and have a beautiful purple hue! The antioxidants (however much there may be) are just a bonus. Alright I got sidetracked there, back to the recipe. Acai has a naturally low sugar content compared to other fruits so to sweeten things up I add frozen blueberries and strawberries. Most acai bowl recipes stick with a mixed berry base but don’t feel forced into using blueberries and strawberries, any berries will work. For the liquid component I use coconut milk because it’s tropical, creamy, and delicious – but any milk will do. The final ingredient is a banana (preferably frozen). Using frozen fruit in smoothie bowls is incredibly important to getting the right texture, so don’t think you can get away with using fresh fruit and a few ice cubes. Add all of your ingredients to the blender and blend until thick and creamy. That’s it, we’re done right? Nope. Just because you have the perfect consistency acai smoothie in a bowl doesn’t mean you’ve made an acai bowl. The toppings are the most important part! In my opinion a true acai bowl needs two types of toppings; fresh tropical fruit and something crunchy. I use mango and kiwi for the fruit and granola to add a crunch but this a great place to get creative and make this bowl truly yours. Just be sure to comment below if you found something really delicious. Seriously though, don’t hold out on me. We don’t like secrets around here. This was yummy! Thanks for sharing! Thanks Mindy! Glad you enjoyed it!